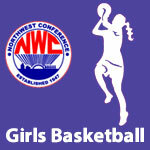 Basketball Girls – NWC-Sports.com | The Official Site of the Northwest Conference for nwc news, nwc scores and more. Bluffton senior guard Alivia Koenig was selected as the 2018-19 NWC Player of the Year in voting by Northwest Conference girls basketball coaches. 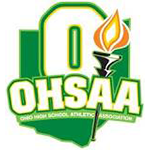 Koenig edged out teammate Averey Rumer, Rylee Sybert, Columbus Grove and Lexi Gregory, Crestview in a close vote. Koenig averaged 13 points and 3 assists per game in leading the Pirates to a 17-5 regular season record. Entering tournament play, Koening had amassed a career total of 1,303 points and was a second-team all-NW Ohio selection as a junior. Joining Koenig, Rumer, Sybert and Gregory on the NWC First Team were sophomore Emma Leis, Spencerville and freshman Makenzie King, Columbus Grove. Koenig was named a first team selection all four years of her career while Rumer and Gregory were repeat selections. Eric Garmatter, who led Bluffton (7-1) to a co-championship with Columbus Grove for the NWC girls basketball title was selected as the NWC Coach of the Year.